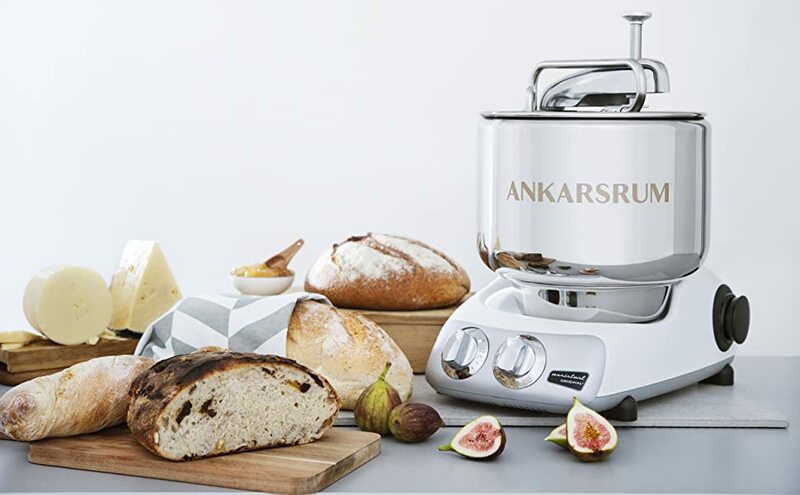 Mix and knead your bread dough, cookie dough, cake batter and just about any other baked good, with the Ankarsrum Original stand mixer. This one of a kind mixer features a stainless steel bowl and carbon steel base with a Matte finish in Royal Blue. 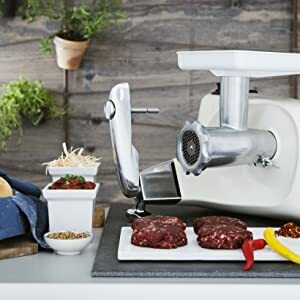 Machine includes a 7 liter Stainless Steel mixing bowl, dough roller, dough knife, dough scraper, dough hook and dust cover lid (perfect for allowing dough to rise in the bowl). The large stainless steel mixing bowl has an astounding capacity of 21 cups of flour and a unique revolving design. As the bowl turns, the deeply fluted roller acts as your fingers, with the scraper mimicking the palm of your hand. The scraper folds the dough with a rhythmic motion while the roller provides a powerful massaging action. These mixing attachments are gentle enough for gluten free batters and perfect for higher hydration dough. The sturdy dough hook is designed for dryer, heavier doughs and kneads by stretching, pulling, and folding the dough around the hook as the bowl turns. 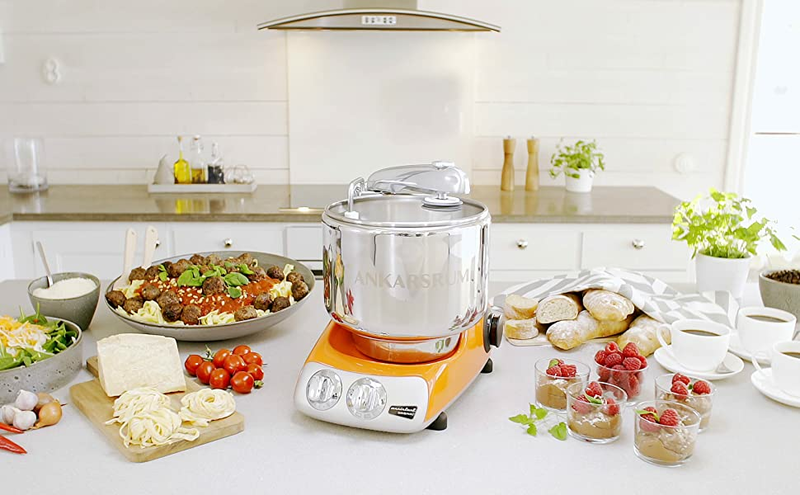 The unit also includes a 3.5 liter Double Beater Bowl made from BPA/BPS FREE Tritan plastic, a durable plastic that is safe to use with boiling sugar syrup and will not leave a fatty residue after whipping cream. Includes a set of multi-wire balloon whisks, perfect for cream, egg whites, meringue, marshmallows and any other light batter you wish to whip and aerate. Also included, is a set of single-wire whips, designed for light batters and soft cookie dough. Room temperature butter or cream cheese should always be used with the beater assemblies. The speed control knob allows for a seamless transition from 45 to 130 RPM, and the electronic speed sensor automatically adjusts motor torque to the load. The On/Off knob is also a 12 minute timer, so it will do its work while you do other tasks, stopping when you want it to. The control panel is angled for comfortable use, and the large timer and speed controls are attractive and easy to read. 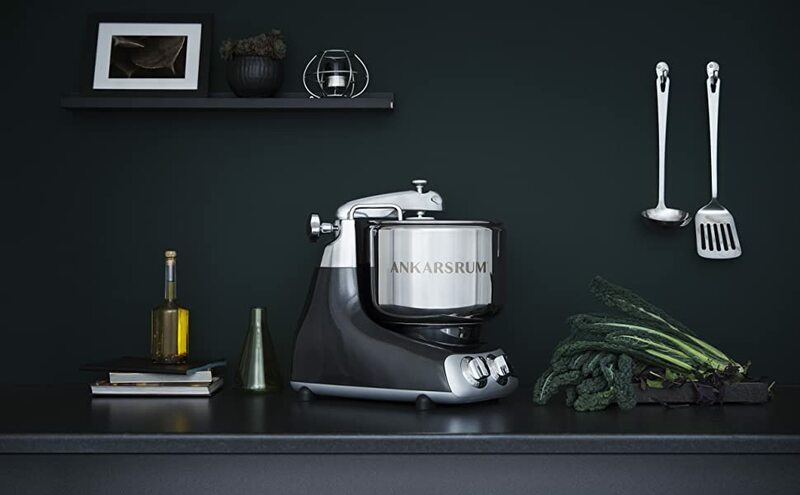 The gold standard of mixers for bread baking, the Ankarsrum Assistant Original was the first Swedish kitchen machine when it was launched in 1940. 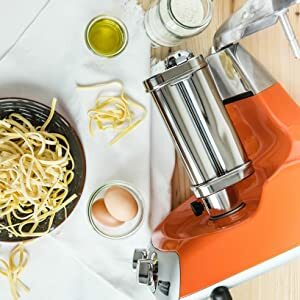 This uniquely designed machine, mixes dough better than any other residential stand mixer. Strong and powerful, your bread will rise higher and have better texture when mixed in an Ankarsrum. With its 7 Lt. stainless steel bowl, mixing 12 lbs. of dough is just as easy as mixing 1 lb. of dough. 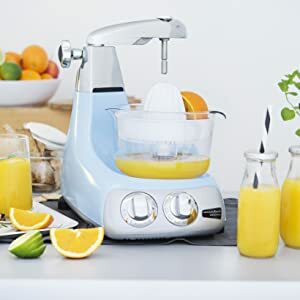 NOT JUST A MIXER – THE "ASSISTANT" OF YOUR DREAMS! Turn the machine on its side to use the optional Meat Grinder/Mincer Attachment and your Ankarsrum lives up to the name “Assistant”. You now have absolute control of the meats you feed yourself and your family! Why stop there?! Use the Sausage Horns to create the flavor profiles you desire with homemade sausage. Using the optional Citrus Press Attachment, squeeze your own juice for the perfect vitamin boost each day. There is also a Blender attachment for making smoothies and soups. In 1940, the Assistent was launched by Swedish white goods manufacturer Electrolux. The Second World War meant that Swedish households were forced to review their expenses, with families baking, cooking food, making jams and syrups and preserving food much more than they had previously. All that needed a robust, reliable kitchen assistant.